Bravelle specialises in post-mastectomy bras, swimwear and breast prostheses for breast cancer survivors. With a store in Ballyneety, Co. Limerick, products can also be ordered online for delivery throughout Ireland. Bravelle was founded in 2005 by Pauline Conway following her own breast cancer surgery and subsequent difficulties in finding suitable post-mastectomy bras. Her experience has allowed her to create an environment in which customers are instantly put at ease while choosing from an extensive range of garments that, until now, were unavailable in Ireland. Pauline believes that neither femininity nor fashion should be sacrificed when shopping for post-mastectomy bras, and this is reflected in the comprehensive range of bras that they stock. All bras and swimwear are fitted with discreet pockets to securely hold a prosthesis in place, and a selection of higher-cut styles is also on offer to cover any scarring. 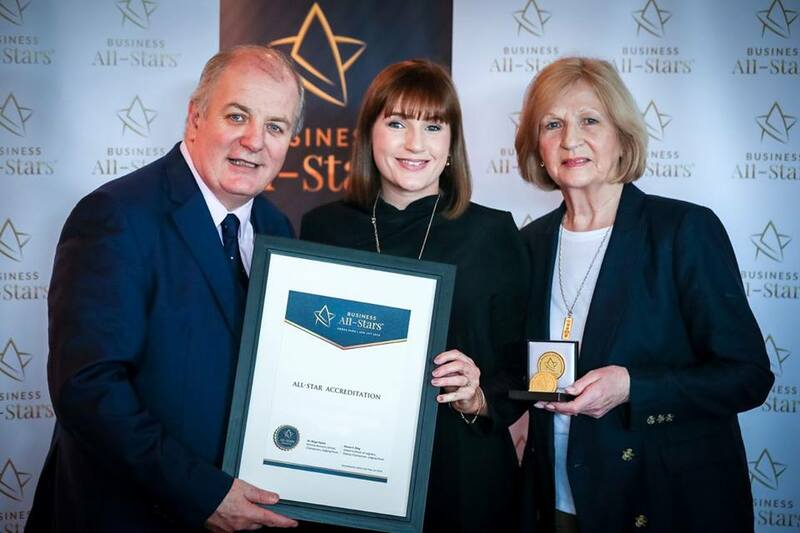 Just last week Bravelle were accredited with the Social Entrepreneur All-Star at the recent All-Ireland Business Summit – an annual competition designed to identify, recognise and accredit Irish companies and individuals that have distinguished themselves in the conduct of their business over the last 12 months. “The decision to designate Bravelle Specialist Lingerie with Social Entrepreneur 2018-19 is based on the score achieved in four rounds of intense competition. The application, supported by references, interviews and independent ratings from the ‘mystery shopper’ process left the adjudication panel in no doubt that Bravelle is richly deserving of this accreditation.” Kieran F. Ring, CEO Global Institute of Logistics, Deputy Chairperson, Adjudication Panel, All-Ireland Business Summit. Both full and partial prostheses are available at Bravelle, and Pauline and her daughter Kate are trained to help you find the perfect fit. Both Pauline and Kate have been awarded the Anita Care “Centre of Excellence” award for bra and prosthesis fitting and Bravelle is the only Anita Care “Centre of Excellence” in the Mid-West. All body shapes and post-surgery needs are catered for, and Bravelle are committed to using reduced-weight materials so that the prosthesis looks and feels completely natural. Bravelle’s collection of bras come in a range of colours, styles and sizes, with matching briefs also available. Bravelle rejects the notion that post-mastectomy underwear has to be drab or outdated. They stock bras with clear straps, multi-way fastening options and cami-effects so you never have trouble finding the right style for that special occasion or little black dress. Bikinis, tankinis and swimsuits make up their holiday collection, and come in an array of colourful patterns and flattering cuts. Pauline and Kate regularly travel to the UK and Europe on the lookout for the latest styles and fashions, bringing their finds home with them. For 2018, they will be introducing breast prostheses, post-surgery bras and swimwear from Amoena, as well as swimwear ranges from Anita, Sunflair, Nicola Jane and Susa. Stylish lingerie from Anita, Susa and Trulife is also available, as is the extremely comfortable Theya lingerie range. They are also looking forward to introducing a fantastic new sports bra from Anita later this year. Pauline and Kate keep Bravelle customers updated on an ongoing basis on their Facebook page about new stock arrivals – you can visit their Facebook page here. For more information about Bravelle or directions to their store in Limerick, visit the Bravelle website here.